(CNN) -- Israel faced an onslaught of intense international criticism as it continued the release of activists detained after Monday's commando raid on an aid flotilla bound for Gaza in defiance of a blockade. An Israeli Foreign Ministry spokesman said 380 Turkish nationals were being sent home Wednesday. All of the activists, which totaled about 600, will be released no later than Thursday, Israel said. Most were initially taken to Beer Sheva prison in southern Israel before being transferred to other facilities. Monday's Israeli military operation, that left at least nine people dead, has been heavily criticized by many in the international community. The Central American nation of Nicaragua announced Tuesday evening that it was suspending diplomatic relations with Israel. "The government of Nicaragua emphasizes the illegality of the act committed by Israel in international waters in violation of international law and international humanitarian law." Turkish Prime Minister Recep Tayyip Erdogan accused Israel of a "bloody massacre." Turkey is Israel's closest Muslim ally. "We see clear murder taking place, and we see an aggressive country" that's not regretting this, Erdogan said Tuesday in a parliamentary address. "We're sick and tired of your lies. Be honest." How has the world reacted to the raid? In an hour-long conversation with U.S. President Barack Obama, Erdogan said that "Israel is about to face the danger of losing its only friend in the region that made the highest contribution to peace in the region," the Turkish prime minister's office said in a statement. "The steps that it will take in the coming days will determine its position in the region." In the pre-dawn raid, Israeli soldiers abseiled onto the deck of the ships from a helicopter. The boarding of the ships took place in international waters more than 70 nautical miles (130 km) outside Israeli territorial waters, according to Turkish pro-Palestinian group Insani Yardim Vakfi (IHH), one of the flotilla organizers. It is not clear how many people died. Israel put the number at nine but did not release the names of those who died. The Free Gaza Movement, another of the groups that organized the six-ship convoy, said the fatalities numbered higher but did not offer an exact number. Seven Israeli soldiers were wounded in the raid, the Israeli Defense Force (IDF) said Monday. Some of the first accounts emerged Tuesday from witnesses who were aboard several boats stormed by Israeli forces. "It was an absolute planned shock and awe aggression," said Norman Paech, a former German lawmaker, in Berlin. "They came from the helicopters down from the top and started shooting around them." But an Israeli naval commander who boarded the boat described a different scene. "At the moment I saw people holding knives who were approaching me and attempting to stab me, I took out my weapon and shot one bullet," said the man, who did not want to be identified publicly. "A great amount of people threw me down to the main deck, to the lower deck. As I was thrown down, a group of another 10 people jumped on me, stabbed me with a knife in my stomach." "Israel is about to face the danger of losing its only friend in the region. Israel has said its forces found several weapons among the passengers on the "Miva Marmara." Israel also has said that its forces started shooting only after passengers on the ship assaulted them. Zoabi said the military operation lasted about an hour and that she saw five dead bodies in that time. Also Tuesday, Egyptian President Hosni Mubarak approved the opening of the Rafah crossing between Gaza and Egypt for humanitarian purposes, state-owned television reported. The border crossing that links Egypt to Gaza will be kept open for only a few days, Palestinian officials said. In Cairo, demonstrators gathered in front of the upper house of parliament and called on the government to expel the Israeli ambassador. In Gaza, women and children rallied outside a U.N. office in opposition to the Israelis. And in Indonesia, about 1,000 protesters from a hardline Islamic group marched in front of the U.S. Embassy in Jakarta. The group's spokesman called Israel "a cruel colonizer." Meanwhile, three people died in an Israeli airstrike in the Gaza town of Beit Lahiya, Palestinian sources told CNN. The Israel Defense Forces confirmed it launched a strike that it said generated secondary explosions, suggesting that ammunition or explosives were in that area. Israel imposed a blockade of Gaza in 2007 after the militant Hamas took control of the Palestinian area and Egypt closed off the Rafah crossing. The aid flotilla challenged the blockade. The IDF said the aid aboard the flotilla's three cargo ships had been transferred into Gaza through the Kerem Shalom border crossing, a main entry point used by Israel. 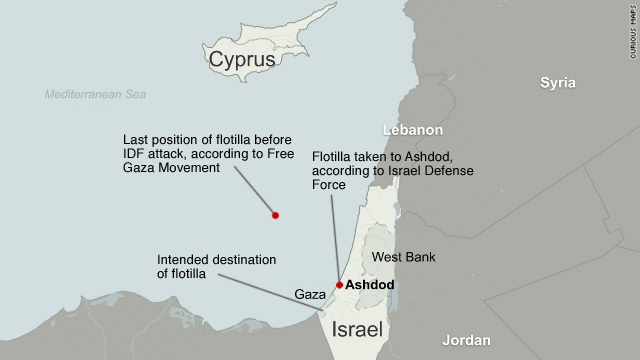 Israel described the flotilla as a "provocation." Israeli Prime Minister Benjamin Netanyahu canceled a scheduled meeting with Obama this week to return to Israel to manage the crisis. Netanyahu said Tuesday that Israeli troops had faced a lynch mob. Israel's minister of public affairs, Yuli Edelstein, told CNN that an IDF soldier was wounded with a gun that was not an IDF gun. "They're definitely not peace activists," he said about those who were aboard the ship. Yigal Palmor, the Israeli Foreign Ministry spokesman, told CNN on Tuesday that Israel regrets the casualties but said "the sole responsibility" for the violent incident lies with activists who have "chosen violence and confrontation." Forty-five activists agreed to identify themselves to Israeli authorities and are citizens of the following countries: Azerbaijan, Belgium, Bulgaria, Czech Republic, France, Germany, Greece, Sweden, Turkey, the United States and the United Kingdom. They have now either left Israel or are on their way out of the country, an Israeli official said. Those who remain detained are ones who have refused to identify themselves to Israeli immigration authorities, an Israeli Prison Authority spokesman told CNN. None were placed under arrest, he said. The U.N. Security Council called for a "prompt, impartial, credible and transparent" investigation. "The Security Council deeply regrets the loss of life and injuries resulting from the use of force during the Israeli military operation in international waters against the convoy sailing to Gaza," the 15-member council said in a statement. "The council in this context condemns those acts which resulted in the loss of at least 10 civilians and expresses condolences to the families," it said. In Washington, U.S. Secretary of State Hillary Clinton said the United States was open to an investigation that would include international participation. "The situation in Gaza is unsustainable and unacceptable," Clinton told reporters in a joint news conference with Romanian Minister of Foreign Affairs Teodor Baconschi. "Israel's legitimate security needs must be met, just as the Palestinians' legitimate needs for sustained humanitarian assistance and regular access for reconstruction materials must also be assured." But the ultimate solution to the conflict, she said, must be based on a two-state solution negotiated between the parties. The ships were carrying more than 10,000 tons of aid and 600 passengers from more than 20 countries, according to the Free Gaza Movement.